Arrive at Zurich Airport and proceed to basement & board the Swiss Trains to Gstaad. On arrival at Gstaad check in the hotel and relax for some time. In afternoon proceed to half day sightseeing of Gstaad Promenade and famous chocolate shop thereafter visit Olympic Museum, After sightseeing back to the hotel. Overnight stay at the hotel. After Breakfast proceed to full day sightseeing of Glacier 3000 by bus to Col Du Pillon and connect to cable car to Glacier 3000 at 10,000 ft above sea level and you can also enjoy the Roller Coaster in summers. Later back to the hotel. Overnight stay at the hotel. After Breakfast check out the hotel and proceed to Interlaken. On arrival at Interlaken check in the hotel and relax for some time. Rest of the day is at leisure for your individual activities. Overnight stay at the hotel. 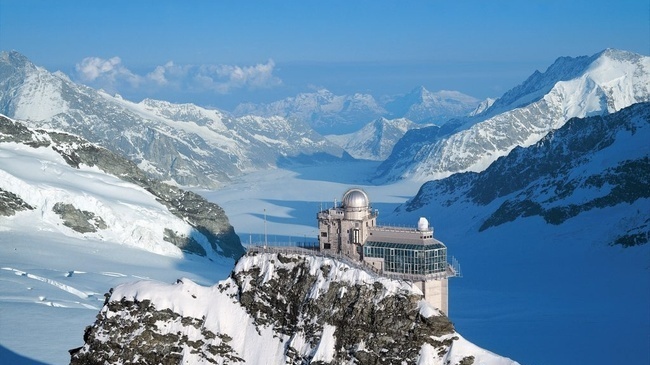 After Breakfast proceed to full day sightseeing of Jungfraujoch. Rest of the day is at leisure and you can also visit famous Ice- Palace. After sightseeing back to the hotel. Overnight stay at the hotel. After Breakfast check out the hotel and proceed to Zurich by train. On arrival at Zurich you are transferred to airport to board a flight for your onwards journey. Airfare valid for this package. Travel insurance valid for the duration of the tour. Any increase in airfare and airline taxes charged by the airlines on your ticket (calculated as on 1st May, 2014). Cost of deviation and cost of extension of the validity on your ticket. Service tax is additional and is applicable over and above the total tour cost. Cost of items of personal nature such as laundry, telephone calls, room service, alcoholic beverages, mini bar charges etc. If you have not decided yet or wants to customize tour itinerary or hotels listed above in "3 White Peaks Of Switzerland Tour Package By Make My Trip", then we can change the travel itinerary and make a personalized, tailor-made holiday package, especially for you. We can modify this travel package as per your itinerary, budget, duration and the tourist places you would like to visit, including transportation and airfare should be included or not. Please fill the form below to contact us.